‘The Ministry of Magic felt strongly, however, that to construct an additional wizarding station in the middle of London would stretch even the Muggles’ notorious determination not to notice magic when it was exploding in front of their faces.’ – J.K. Rowling Pottermore Presents is a collection of J.K. Rowling’s writing from the Pottermore archives: short reads originally featured on pottermore.com. These eBooks, with writing curated by Pottermore, will take you beyond the Harry Potter stories as J.K. Rowling reveals her inspiration, intricate details of characters’ lives and surprises from the wizarding world. 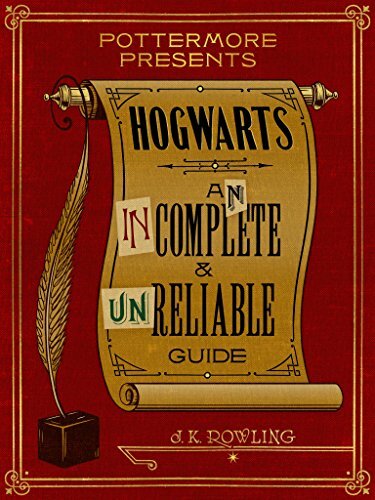 Hogwarts An Incomplete and Unreliable Guide takes you on a journey to Hogwarts School of Witchcraft and Wizardry. You’ll venture into the Hogwarts grounds, become better acquainted with its more permanent residents, learn more about lessons and discover secrets of the castle . . . all at the turn of a page.